Provide comfort for the family of Grace Hunt with a meaningful gesture of sympathy. 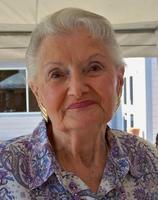 Grace H. Hunt, 88, of Palatka, passed from this life on Monday, April 1, 2019 at Solaris Healthcare Palatka following an extended illness. She was a native of Huntington Station, New York and had lived in Putnam County for the past 25 years coming from Kewanee, IL. She had worked for many years in the bag factory for Hudson Pulp and Paper, Co. and was a welder for the Hyster Corporation in Kewanee. She was of the Baptist faith. Grace enjoyed reading, knitting and playing board games with her sisters. She also enjoyed bowling and was an avid Atlanta Braves fan. She is preceded in death by her parents Ed and Sophie Feagin, and sisters, Sally Blevins, Loretta Hadders and Johanna Wilkinson. She is survived by her daughters, Sonya Stewart and Andrea Ford both of Palatka, siblings, Geraldine Wilkinson (Perry), Mary Sheffield (Clifford) and Michael Feagin (Evelyn), grandchildren, Jeffery David Fleming, Bradley Michael Fleming, Shaun Eric Stewart, Tara Crews, and John Williams, Jr., 8 great-grandchildren, and 4 great-great-grandchildren. Crypt-side services will be held at 11:00 a.m. on Monday, April 15, 2019 at Palatka Memorial Gardens with Bro. Willie McKinnon officiating. No visitation is scheduled. Memories and condolences may be expressed to the family at Grace’s Book of Memories page at www.johnsonoverturffuenrals.com . To send flowers in memory of Grace H. Hunt, please visit our Heartfelt Sympathies Store. Provide comfort for the family of Grace H. Hunt by sending flowers.